Luxury design diamond bangles, available in set of two, crafted in 18 karat white gold with yellow gold accents, in a swirling and floral pattern featuring 1437 diamonds, weighing 10.19 carats in total. The hinged bangles secures with a tongue and groove clasp. 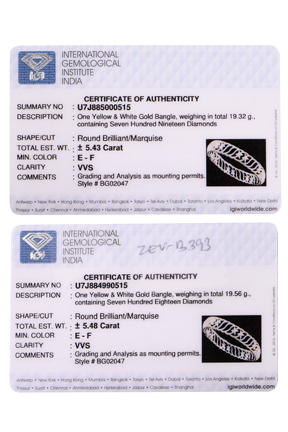 IGI Certificate is available with purchase.